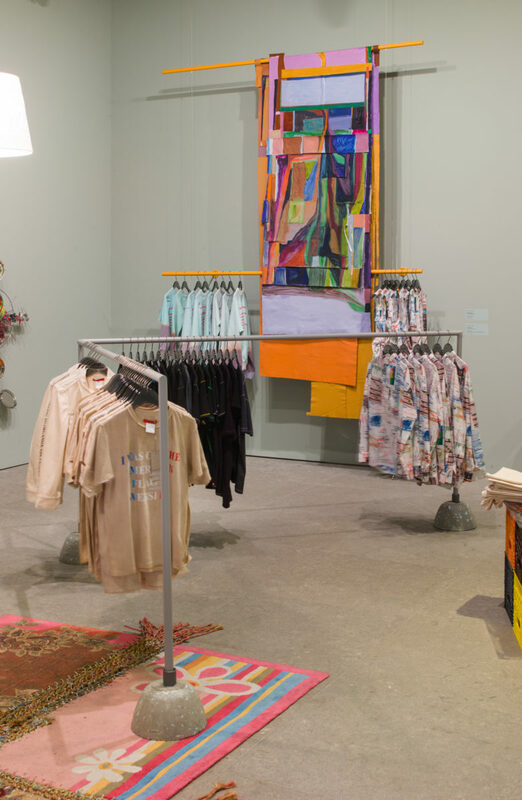 Nearly two decades since New York’s Whitney Museum of American Art hosted its last fashion focussed exhibition, the institution has opened its ground-floor John R. Eckel, Jr. Gallery to Eckhaus Latta: Possessed, an immersive installation by fashion designers Mike Eckhaus and Zoe Latta. On view until 8 October, the duo’s first solo exhibition explores themes of desire, consumption, and surveillance in the consumer experience, showing newly commissioned Eckhaus Latta designs alongside artwork, backdropped by a curated playlist. “We worked together to create this exhibition in the same way we build all of our Eckhaus Latta collections and spaces. From our L.A. store to our runway shows and pop-ups, we build them with each other as well as our broader community. The music is just one aspect of creating a complete and absorbing environment … We chose songs that evoked a feeling or a mood that we hope will add to the overall experience of being fully present in the exhibition,” the designer’s explain. Unlike other exhibitions at the Whitney, Eckhaus Latta: Possessed encourages visitors to touch, try on, and even purchase pieces directly from the show. The Rhode Island School of Design graduates are known for using unexpected materials, emphasising texture and tactility in their designs, and for incorporating writing, performance, and video into their practice. Through collaborations with artists, musicians, and others, and an approach that plays both with and against industry conventions, the show embraces and brings into conversation various aspects of the fashion industry, from advertising to voyeurism. On entering the exhibit, visitors are presented with a sequence of images that riff on the tropes of familiar fashion layouts, exploring how Eckhaus Latta’s distinctive aesthetic operates in relation to those of the mainstream fashion media. The core of Possessed is a functioning retail environment in which visitors may touch, try on, and purchase clothing and accessories designed especially for the show. The presentation includes a range of one-off and limited edition clothing and accessories reflecting the brand’s enduring interest in materiality. 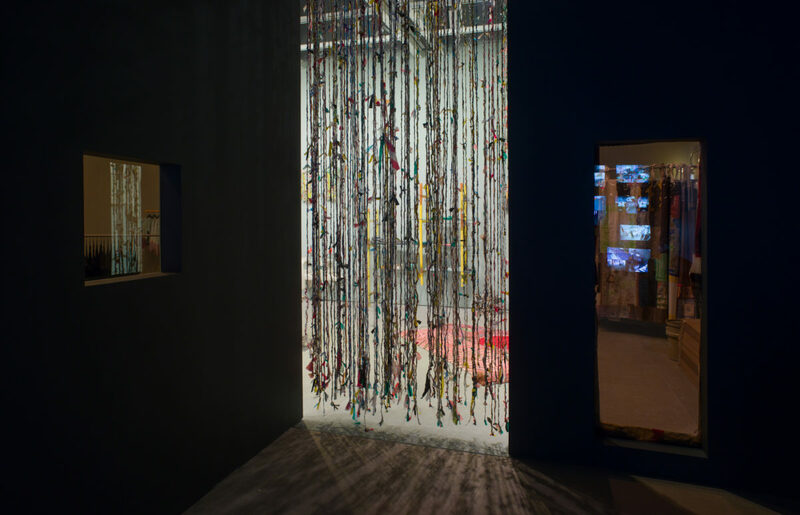 The show, organised by Christopher Y. Lew, Nancy and Fred Poses, and Lauri London Freedman, in collaboration with the designers, smudges the boundaries between art and fashion, whilst underlining the latter’s comfort with commerce and the art world’s tumultuous relationship with it. In keeping with their collaborative approach, the pair displays their pieces on and around fixtures, furniture, and art by a dozen creatives in their community including Brooklyn-based artist Susan Cianciolo and Latta’s designer father. 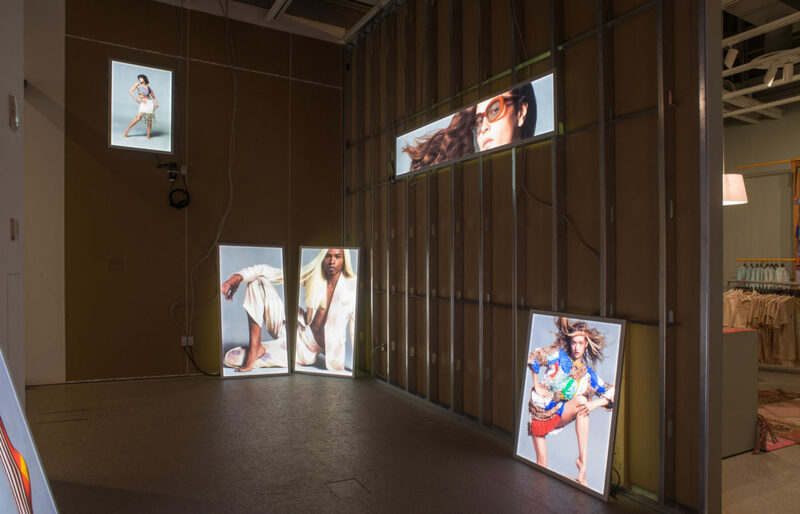 In the final room, a grid of wall-mounted monitors show a livestream of the previous retail space and surveillance footage from Eckhaus Latta’s Los Angeles store, as well as the brand’s stockists from Galeries Lafayette in Paris to Maryam Nasir Zadeh in New York. Mirrors fixed into the walls are exposed as semi-transparent glass, making the space’s visitors become temporary voyeurs. These various modes of surveillance, presented in a surprisingly engaging layout, bring the intimate and potentially invasive nature of contemporary retail culture to the forefront.